In business, as well as in life, the potential for bad credit can lurk just around the corner. Small to medium sized businesses strive for good credit scores so that, should it be necessary, obtaining a bank loan in order to grow won’t be a problem. But if a business falls into the bad credit rut is there an answer that not only helps improve credit scores but also meets immediate cash flow requirements? In bad credit situations, it is important to get a handle on the reason for the bad credit. Was it a one off situation, or is there a fundamental issue with cash flow? Getting your business score back on track is important for a business to grow. In a push, using credit cards may seem like an obvious option, but if the problem is not addressed, the credit card debt will grow, payments will be hard to maintain, and the bad credit situation ends up getting worse. Obtaining a new credit card with bad credit means the business will then be dealing with incredibly high interest rates. Microloans have become a more popular option for businesses with less than stellar credit, and if they are handled correctly, can certainly provide a viable answer to the problem. One extra benefit is that these providers will report regular payments to credit bureaus, which can help raise credit scores. Make sure you do your research when considering any type of loan, as there are many options, some much more reliable than others. Be aware that, unlike credit card payments, the monthly amount will be set in stone, and payments cannot be missed. There are many reasons that your business credit rating may have slipped. If you have a healthy amount of outstanding invoices, but have extended long credit terms to your customers, your problem could be easily addressed using invoice factoring. This type of financing does not require your credit history, rather the credit history of your customers. Once you have addressed cash flow, your credit score should start improving also. 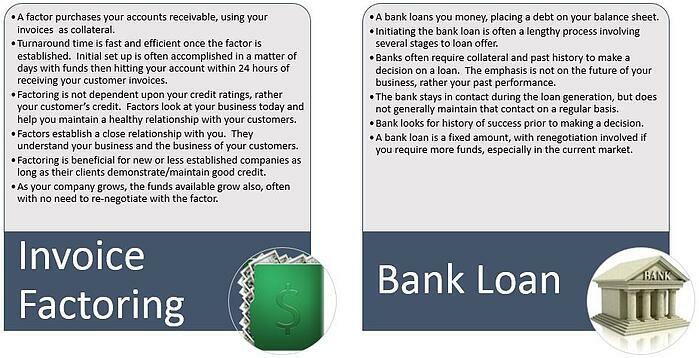 Consider the benefits of invoice factoring versus a traditional bank loan. Factoring your accounts receivable offers a financial solution that can answer the cash flow dilemma. Don’t let bad credit get the better of your business. Contact Bay View Funding today and talk to one of our team of financial experts.